First foods for baby that could support their gut health - The Infant Complementary Feeding Study. We want to find out whether feeding your baby a specific type of food (kumara) has a positive effect on their gut bacteria and protection against infection. Weaning is a time of big change for a baby. Starting solid foods and consuming less milk alters their gut and immune function, while triggering developmental changes. The weaning period is a great opportunity to introduce food and drinks that optimise a baby's health. This study will explore the role of complementary foods in the development of immune health, with a specific focus on the role of gut bacteria. This small study will also help us work out whether it's possible to carry out a large-scale complementary feeding intervention in the future. Recruitment for this study is now complete. 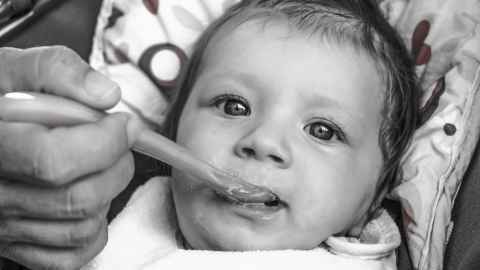 We've enrolled 40 babies in Auckland who haven't yet started solids. They will receive the feeding intervention around six months of age*, at the time when the caregiver decides to offer baby their first food. Their participation in the study will finish when they turn one. Participating babies will be randomly split into two groups. In Group 1, 10 babies will receive a probiotic that is known to show immune benefit(s) in young children (Bifidobacterium Lactis). In Group 2, 30 babies will receive a freeze-dried kumara powder mixed into their food. Babies will be given the required amount of kumara powder or probiotic for a total of six months. During the study we’ll collect stool, urine, blood, saliva and breast milk samples four times. *according to the New Zealand Ministry of Health recommended age for introducing complementary food. To ask a question or find out more about the study please contact the study coordinators Amy Lovell and Hannah Eriksen via the Nourish to Flourish website. The project partners are the Liggins Institute, the University of Auckland, AgResearch and the Riddet Institute. The research is funded by High-Value Nutrition, National Science Challenge.